Detective Pikachu may have to watch his back as a new detective will be making his way onto the gaming scene. Coming some time in 2020, One woman Development Team Cave Monsters will be releasing their first game on PC and Nintendo Switch. The game is called Lord Winklebottom Investigates and features a Giraffe In a Top hat that solves mysteries. You can read more in the official announcement below. 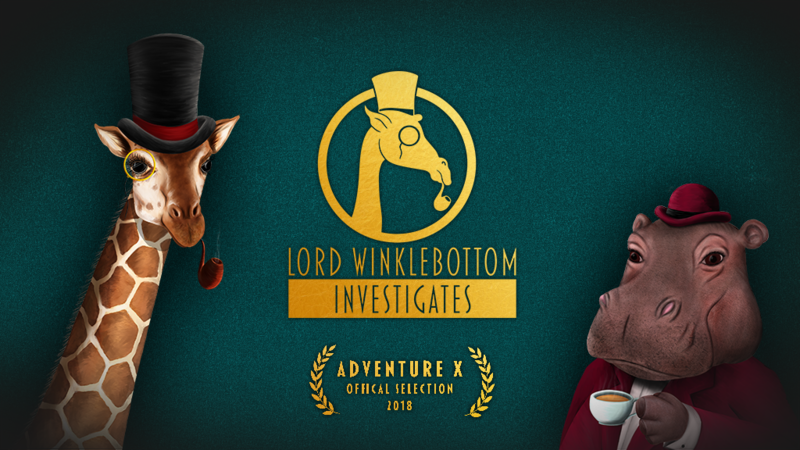 Sheffield, UK – 25th February 2019 – Charlotte Sutherland, solo Developer at Cave Monsters, has today announced that her first release, Lord Winklebottom Investigates, is coming to PC, Mac, Linux and Nintendo Switch. Lord Winklebottom is a classic point and click adventure with a fetching hand drawn art style and a jolly good sense of humour! “Lord Winklebottom is homage to detective stories, particularly those set in the late 19th and early 20th centuries, such as Sherlock Holmes, Agatha Christie and the Paul Temple mysteries.” said creator Charlotte Sutherland, “I’m really excited to bring the strange world of Lord Winklebottom and its bizarre cast of anthropomorphic animals to life, and can’t wait for people to get the chance to play it”. Cave Monsters is looking for £25,000 to help with a Kickstarter campaign that will last 30 days – February 25th – March 26th. The fund will be used to get the game fully voice acted to a high standard, collaborate with a composer to create a unique, 1920’s inspired soundtrack, programming assistance and additional localisation. The game will be released on PC, Mac, Linux and Nintendo Switch™ in Q2 2020. Visit the Steam page for wishlisting and more information. Follow Cave Monsters on Twitter, Facebook and Discord for updates. Cave Monsters is a 1-person game company based in Sheffield in the UK founded by Charlotte Sutherland. Charlotte’s career has spanned roles at Rare, Tt Games, EA and Sumo Digital, with credits in huge game franchises like Little Big Planet the LEGO games. Charlotte’s love for vibrant game worlds, accessible gameplay and strong characters is coming together in her first release, Lord Winklebottom. Visit www.cavemonsters.com or more information.